This US Census is important to Red Lakers and their descendants for two main reasons. 1) It represents the first time the United States Government attempted to gather the same information on American Indians as it did its citizens, and 2) It is the first time the Government attempted to match the Anishinabeg names of Red Lakers with their names of European origin or pronunciation. The reason for the “Lost in the title is that there are cases where one may know the Indian name of an ancestor but not the European name or vice-versa. 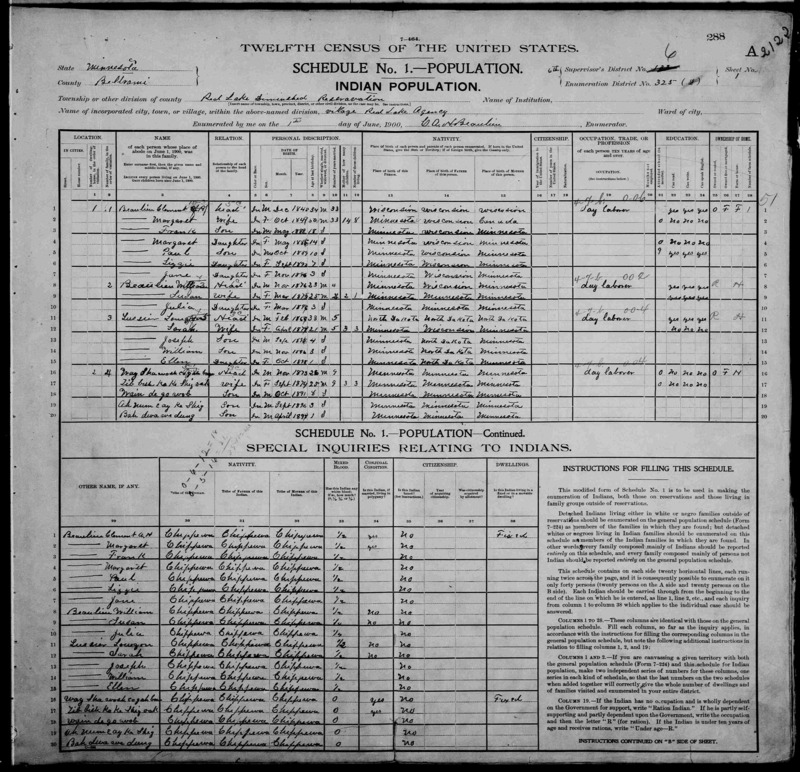 This census is one of the main bridges by which family historians can connect with ancestors they might otherwise miss. Other Names, (which included the Anishinabe’s name) or the same name if the person did not have an Indian name. If the person were mixed blood—the “degree”. (Helpful in establishing Blood Quantum where still applicable) Note: if “0” was listed, the person was a full blood. Whether dwelling was “fixed” or “Moveable”. Caveats: I know there are plenty of mistakes in the transcription. BLAME THE CENSUS TAKERS! When there are two columns present you may enjoy comparing the differences in the spelling. I must say, you gotta give those census people an “A” for creative spelling! But if you see a name you would like me to correct, please let me know. Sometimes you will see only one column listed. That is because the information in the second column is the same as that in the first so I left the second column out. Sometimes you will see: ?? as part of a name, this is because whoever transcribed the name from the Census sheet, (which I then copied and ran through several functions to distill the names out of the information) was unfamiliar with Anishinabemowin and couldn’t figure out what the spelling was from the handwriting, or the image. The name will probably be much more clear to you when you read it from the original image. Image numbers are provided for quick and easy access to your ancestor’s name once you are on the FamilySearch website. FREE! You can do a search for your ancestor’s name(s) by using your web browser’s “Find” function for this page. Also you can use a search engine (like Google) to access these names as well. Good Hunting! PRAYING DAY JOHN Way ?? Tig ?? Mckenzie Wm. S. Mckenzie Wm. S.
On the 1900 Census my great great grandfather was Shah Ko Daigneault. They misspelled Daignault and they also misspelled my great grandmother’s name Marianne, it was Mary Ann Daignault. They also misspelled Plante yJane my great great aunt Mary Jane Plante daughter’s, name was Mary Jane Plante. Can anyone tell me how to correct this information. I’m new at this so one more question. I also have pictures of my family that I would like to share and some information. How do I upload pictures? Thank you for your comments! The Census Records themselves can’t be corrected, but I think the best places to share your correct information would be on a couple of the major Genealogy websites. Those would be Ancestry.com; and FamilySearch.com. You can create your own family tree on Ancestry.com and also upload pictures there. You don’t have to pay to make your own family tree. You can also start your own family tree on FamilySearch.com. That site is free and other people can freely access the information. I would recommend the FamilySearch site first as you can also get all kinds of help getting started there. Best wishes on your Genealogy! Thank you so much for the response and for the information. I am a member of Ancestry and I just figured out how to edit some of the census. It will not change the census form, but you can edit and correct the information below on most of the census. I also have been adding comments to them. There are so many of them sometimes I get over whelmed. Back in 2006 I had a head injury, so none of this comes easy for me. I just sign up with FamilySearch last weekend. I’m still trying to figure out how it works. This website has some great information. But this website also has some incorrect information on it too. I also found my family on the Village of Fisher 1885 Census and on that Census they marked everyone as white. I don’t know how they could have done that, if you saw pictures of my family you can see they were not white and they didn’t speak English. This is one Census they will not let you edit the race. Can you tell me how do I find there roll numbers? where do I look? What year did they start to do them? and where do they keep them for Red Lake? how do I get copies of them? Can you also tell me how I go about proving our family’s heritage to the tribe? Any information and help, will be greatly appreciated I am not doing this for money. I don’t even know if there is any money involved. If there is I will donate it back to the Tribe and maybe a little to Saint Mary’s Mission in Red Lake. I would only like to keep enough to go to the reservation to see where my family is from. I’m far from being rich but I couldn’t take away from the tribe. That my family loved so much . Thank you for you time and I will try not to ramble so much next time. Your best bet for answers to your questions about roll numbers would be the Red Lake Tribal Council. 218-679-3361. Just wanted to say thank you so much. Wow. Talk about passionate. What an interesting post.